With not a word out of place, Laurie Duggan's minimalism is exceptionally distinctive - conceptual, clear, sometimes droll, the mood sustained throughout. This chapbook is an artwork. 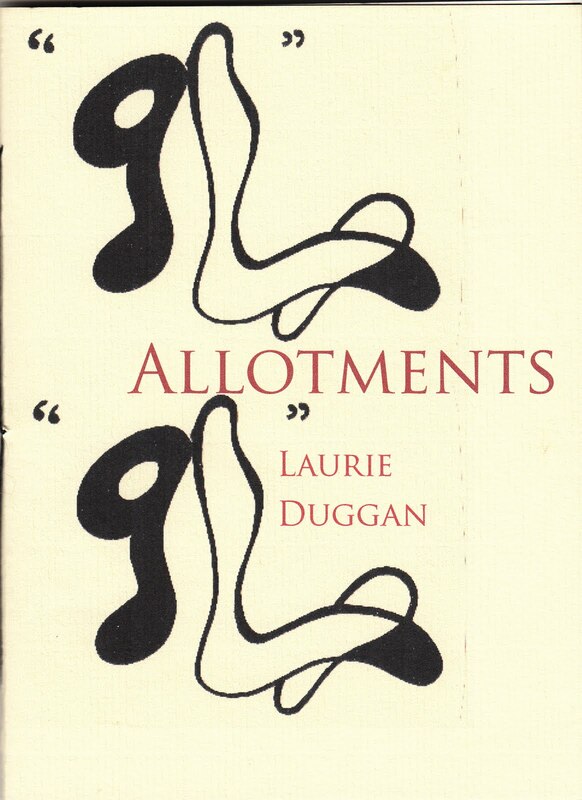 These twenty nine 'Allotments' compile traces of walks and bus and train trips around Canterbury, to London, to poetry readings, to the back garden of his 'improbable' house and to various pubs. Thinking about music, friends, politics (briefly), poets like Susan Howe, Charles Olson, Paul Blackburn and others as he walks, travels or sits with an ale or lager. Published by Fewer & Further Press, in Massachusetts, it's an attractive chapbook with a drawing by Basil King on the covers. There are only 200 of them so if you'd like a copy you should visit Fewer & Further pretty much straightaway. Visit Laurie's blog Graveney Marsh.